『월인석보』는 『월인천강지곡』과 『석보상절』을 합하여 세조 5년(1459)에 편찬한 불경언해서이다. 『석보상절』은 1447년 왕명에 따라 수양대군이 소헌왕후의 명복을 빌기 위해 지은 석가의 일대기를 한글로 쓴 불경서이고, 『월인천강지곡』은 세종이 『석보상절』을 읽고 각각 2구절에 따라 찬가를 지은 것이다. 『월인석보』권 11, 12는 그 동안 알려진 10권 8책에는 없는 부분에 해당되는 것으로 세조 5년(1459)에 간행된 초판본이다. 권 11에는 『월인천강지곡』 제272부터 275까지 실렸고 『석보상절』은 「법화경」 권1의 내용이 실려 있다. 권 12에는 『월인천강지곡』 제276부터 278까지 실렸고 『석보상절』은 「법화경」 권2의 내용이 실려 있다. 이 책은 훈민정음 창제 이후 제일 먼저 나온 한글불교대장경으로, 조선 전기의 훈민정음 연구와 불교학 및 서지학 연구에 매우 귀중한 자료이다. Worin seokbo (Episodes from the Life of Sakyamuni Buddha) is a Korean translation of Buddhist scriptures published in 1459 (fifth year of the reign of King Sejo of the Joseon Dynasty) by compiling Worin cheongangjigok (Songs of the Moon’s Reflection on a Thousand Rivers) and Seokbo sangjeol (Episodes from the Life of Sakyamuni Buddha). 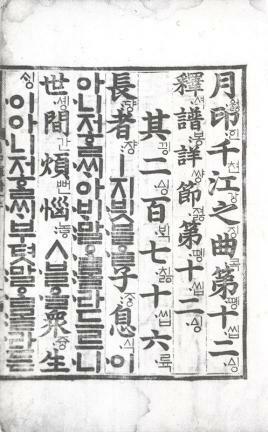 Volumes 11 and 12 of Seokbo sangjeol, which were the missing parts of the entire book, were the first edition printed in 1459. Worin cheongangjigok is included in both volumes, with the first and second volumes of Saddharmapundarika Sutra (Lotus Sutra) put in Volumes 11 and 12, respectively. 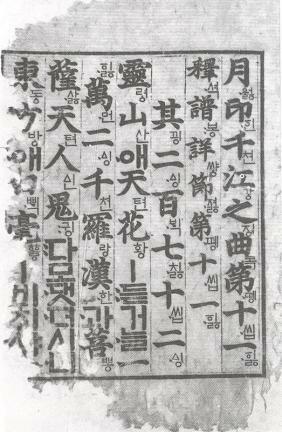 As the first sutra published in Hangeul, Worin seokbo is a valuable material for the study of Hunminjeongeum (Proper Sounds for the Instruction of the People), Buddhism, and bibliography of the early Joseon Dynasty.